Better than multiple wireless sources or range extenders, the Orbi Pro delivers a mesh solution that can cover a medium-sized office right out of the box. Anyone working in an office will know that the distribution of Wi-Fi signals is far from uniform, creating null zones where connectivity is poor or entirely missing. Complaints about this can plague a stretched IT department, who may throw in any number of access points in an attempt to plug the holes in coverage. Eventually, Band-Aid solutions just don’t cut it, and investing in a more holistic approach to wireless networking is the only sensible answer. And for Netgear, its made-for-the-job solution is called Orbi Pro. The term ‘mesh networking’ is bandied about often, but the Netgear Orbi Pro is a classic example of how the power traditionally located in a single router can be distributed across multiple nodes. The value of this approach is a mesh wireless network can cover a large area with consistent links and performance, and allow client devices to roam unhindered throughout. The Netgear SRK60 pack is a starter solution that includes the router-designated module and a single satellite labelled part. Neither element contains a modem, so it assumes that you have a cable or ADSL broadband connection with either a separate modem, or a router that you intend to disable Wi-Fi on. The combination of router and satellite is designed to cover a building of up to 5,000 square feet. Netgear also sells a larger pack with two satellites that covers a whopping 7,500 square feet, should you need more coverage from the outset. Those who are unsure of their spatial requirements can buy additional satellite access points for £260 (around $354), and the router can work with three of them in total, adding an extra 2,500 square feet of coverage for each one. Each node can service up to 40 wireless client devices simultaneously, and a router-plus-three-satellite setup could cover a 10,000 ft office. These second-generation Orbi modules have a distinctive shape that is vaguely reminiscent of a high-end vase. They stand nearly 10-inches (25cm) high and can be placed on any flat surface, or be wall-mounted using an elaborate bracket and plate assembly. The mounting system hides the wired networking ports on the rear of both module types, with three (and the WAN) on the router, and four on the satellite(s). One interesting variation with the Orbi hardware design is that the antennas are internally mounted, so they can’t be easily positioned to enhance connectivity. However, the whole device can be mounted vertically or horizontally, as required, with that positional scope potentially enhancing the number of floors each node can cover. One detail that we noticed in the Netgear product notes is that the Orbi Pro won’t work with the original Orbi hardware, as the satellites will only connect to the Orbi Pro router. 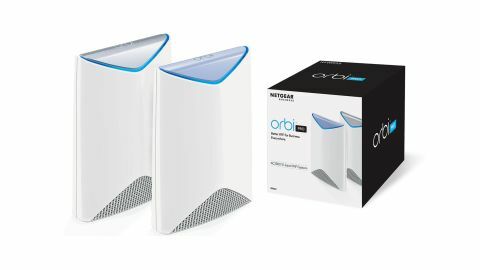 We suspect this is a choice that Netgear made to avoid business customers buying this kit and then cheaper Orbi satellites, and using them in combination. The issue with defining performance on the Orbi Pro is that it is both highly dependent on the environment and how the equipment is configured. But there is another factor which we need to mention, in that as a mesh solution, some of the bandwidth available goes towards allowing the nodes to talk, and more is used up relaying data between them. If you imagine a basic setup where the router services one floor and a single satellite is on the floor above, then any traffic destined for the second node must be sent from the router to the satellite before being relayed to the client device. That eats into the bandwidth allocation for the router even if it isn’t directly talking to the client device, and the same is true in the opposite direction. Or it would be if the Orbi Pro designers hadn’t already considered this problem at the design stage, and come up with a neat solution. Because on the face of it, this is a dual-band 4x4 MIMO system, where you might reasonably assume that with four channels (2 x 2.4GHz and 2 x 5GHz), half of those must be allocated to backbone traffic between nodes. But that’s not how this solution works. Instead, Netgear built this equipment with an 8x8 MIMO capability, leaving dual 2.4GHz and 5GHz channels entirely to service directly connected clients, and four 5GHz channels are left exclusively for the node routing backbone. That’s 1.7 GB/s for the backbone, divided by however many client devices are using the system. Logically, each of the nodes could also be connected by a wired network to reduce relay traffic, but this would create loops within the network structure and routing would go bonkers. Despite the brilliance of this thinking, consideration is still required in terms of where you place the devices. Having all the nodes in a sequential line with the router at one end is much less efficient than having the router at the centre of a satellite swarm, for example. Because 5GHz performance declines more than 2.4GHz over distance, this also limits how far apart the nodes can be, though 5GHz is necessary to provide the amount of bandwidth to give client devices the best possible experience. In our testing, a single client device could get 500Mb/s when close to a node, and at the most extreme ranges performance didn’t drop below 175Mb/s. How exactly these numbers translate to another location is debatable. But theoretically, unless you have a building of an especially awkward construction for wireless communication, then the Orbi Pro should provide an excellent service. And, if it doesn’t, we suspect that whatever mesh network solution you tried would be challenged by that environment. While the hardware looks a little altered from the original Orbi, it isn’t significantly different from a technical viewpoint. However, what has transformed is the software interface, with the focus now on the typical business user, and not a home deployment. Netgear has coded Android and iOS mobile apps that guide you through the deployment in a way that doesn’t assume extensive IT knowledge or experience. The design of this tool allows a small business manager to get the equipment working, and to administer it. One feature we especially liked was that once it’s all running the app will generate a QR code that you can provide to users to get them connected smoothly and quickly. For those with more skills, there is also a web interface that you can get to with a client-connected PC or tablet, and that has more functionality to configure static routes, AP Mode, and activate a guest account among many other features. A prerequisite of using Orbi Pro is that the router unit must be part of the wired network, and the satellite placed at a remote location where the two can still communicate by Wi-Fi. That, in a nutshell, is the central conundrum of the Orbi Pro: where do you put the devices to get the optimal performance? We’d recommend doing a full Wi-Fi sweep using a tool like Netspot to create a wireless map of your building, highlighting those areas that aren’t serviced well currently. Once the system is operational, you can repeat the mapping process to make sure that the problem has been addressed, and can consider moving the Orbi Pro elements around if needed. Doing this might also prove a good justification for buying additional satellites, should that prove to be necessary. Buying equipment like the Orbi and crossing your fingers isn’t a good plan; there needs to be a strategy behind using it. For a small or even medium-sized business, this is Wi-Fi nirvana. The only caveat is the price, which for router technology is a little on the steep side. However, solving existing Wi-Fi problems could easily be worth the investment in terms of recouping lost productivity, even over a shorter timeframe.